It is my favorite time of the year- Football Season! These simple and delicious Football Party Food Ideas will turn your snack table into a touchdown! This post is sponsored by Dean’s Dips. As always, all opinions and text are 100% my own. I am not sure how many of you know this about me, but I am a huge Dallas Cowboys fan! I moved around a lot as a kid, but I have taken my love for the Dallas Cowboys with me to every state I have lived in. I grew up with two brothers and I always loved sitting around with my family on weekends, watching football and rooting against each others’ teams. I have carried this tradition on in my own family, only now I compete against my husband and his favorite team, the Tampa Bay Buccaneers. Now that I’m a wife, a mom, and on occasion a hostess, I gravitate towards party food that is easy, delicious, and gives me time to enjoy the game too! It is also a plus if it pairs well with my favorite sangria recipe. These party food ideas are fan favorites that incorporate one of my all-time favorite party snacks, Dean’s Dips! Like these recipes? Pin them to your GAME DAY pinboard! When hosting a football party, I like to find that balance between serving a few bowls of chips and serving finger foods that require me to get up and run to the kitchen between commercials, referee calls, and time-outs. The goal is to keep the party food table stocked without missing any of the action. 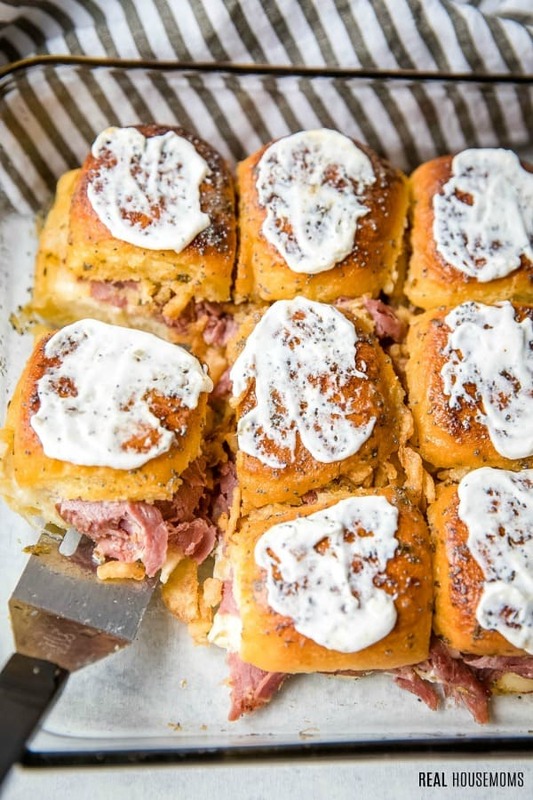 These Roast Beef Sliders are beyond perfect for entertaining any time of the year, but they are especially perfect for football season because they help tame the hunger of the crowd during a long game. 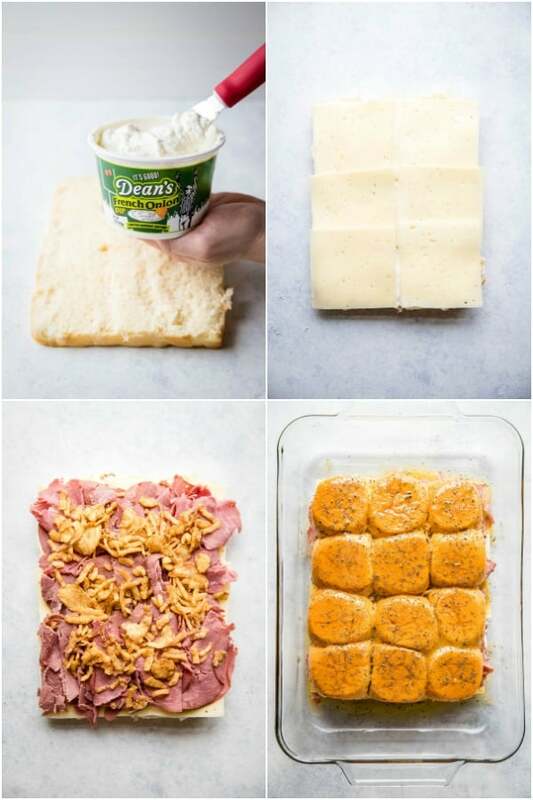 I always have a couple Dean’s Dips on hand when I’m entertaining guests because their French Onion Dip is my absolute favorite for dipping chips, but I bet you never thought to use it as a spread on a hot slider! 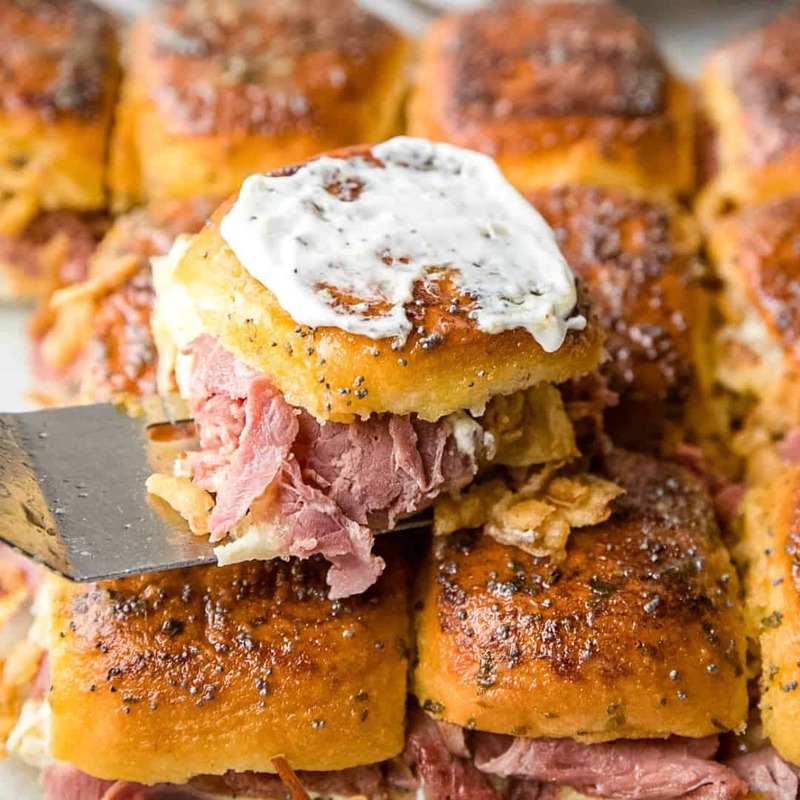 One bite of these Roast Beef Sliders and you will be thanking me. These hot and fresh sliders are the star player among any other super bowl party food! 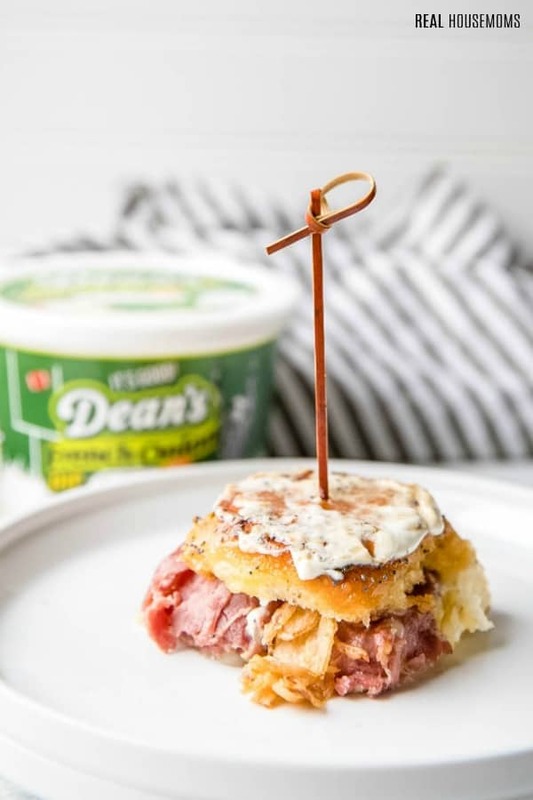 They combine everyone’s favorite Hawaiian-style sweet rolls with roast beef, swiss cheese, Dean’s French Onion Dip, fried onions, and topped with garlic butter. They can be thrown together in ten minutes and emerge fresh out of the oven just fifteen minutes later! If these sliders do not check the box for easy party food, then I am not sure what will. 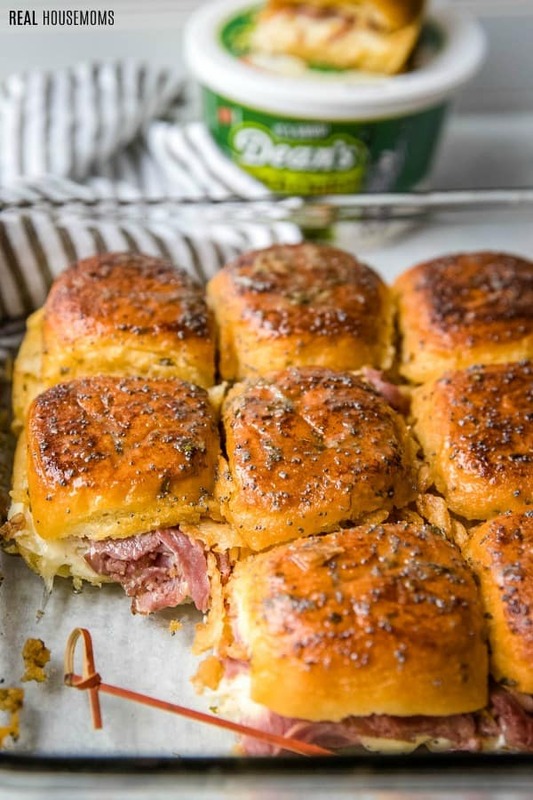 Now that you have served up a plate of fresh, melt in your mouth Roast Beef Sliders using Dean’s French Onion Dip, everyone at your party knows that you are not messing around when it comes to these party foods. 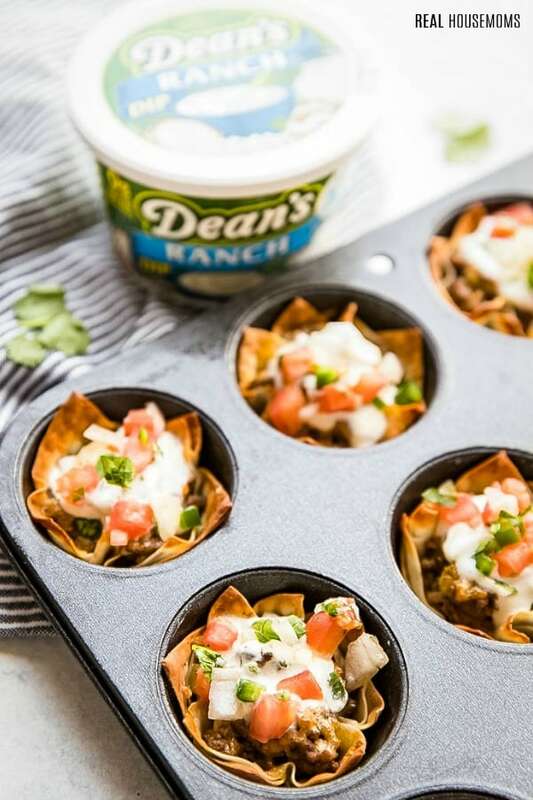 Your next course of finger foods is going to be a delicately crispy Wonton Taco Cup topped with Dean’s Ranch Dip! I love both of these recipes because they’re so easy to make and because my guests always love them and my guests love them because they are easy to eat and they taste amazing. 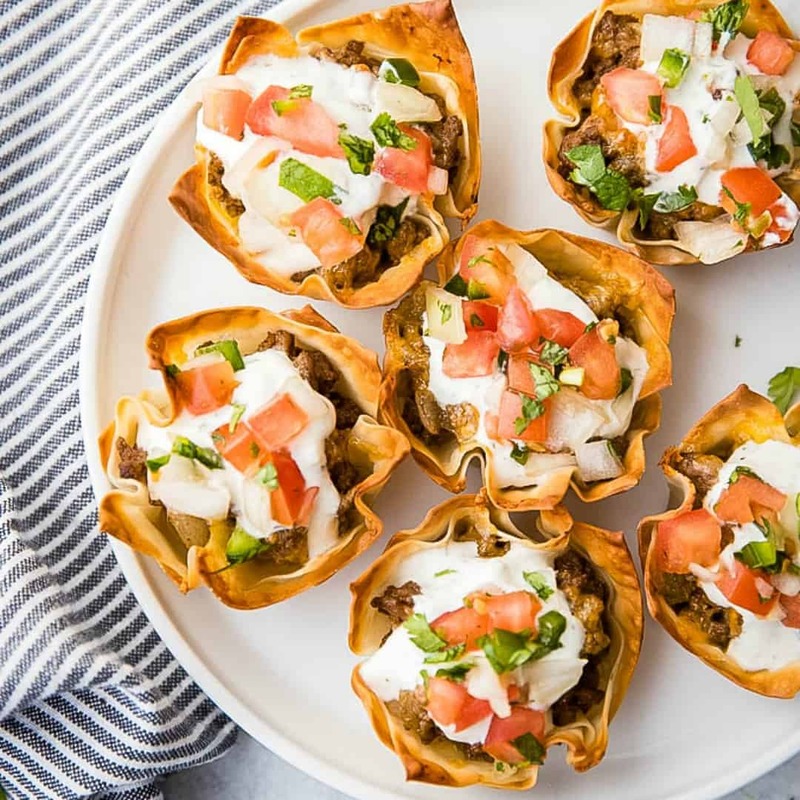 To get started on these Wonton Taco Cups you will only need ten minutes to assemble and then another ten to bake. These are the perfect Super Bowl Party food to throw together during half-time. As I mentioned earlier, I moved around a lot when I was growing up. I spent my late teens and early 20’s living in California where I learned the importance of tacos. Tacos are a versatile food, they are quick and easy to make, can be customized, are always evolving, and never disappoint. Tacos are the ultimate party food. The best part about tacos is that everybody loves them, and I love serving a crowd pleaser. Another crowd pleaser as I have come to discover in ranch. 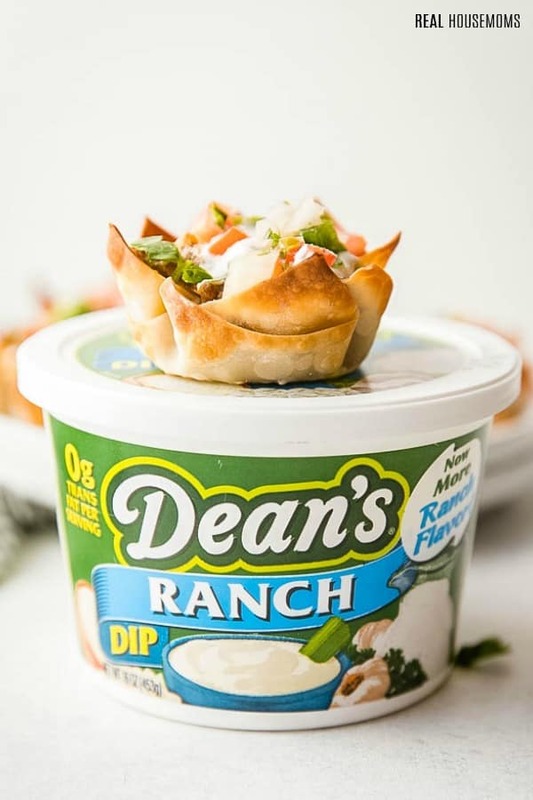 Rarely do I come across a party guest who doesn’t like ranch, which is why Dean’s Ranch Dip is always a must on my Super Bowl Party shopping list! Football season is my favorite season because I truly love the sport, but what makes it extra special are the memories I have made with family and friends while gathering together to watch it. 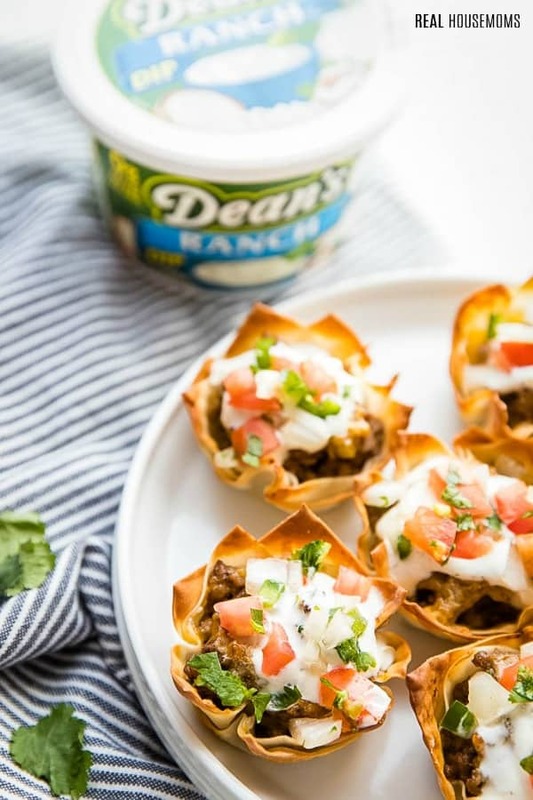 I love to share time and good food with the people I adore in my life and with the help of Dean’s Dips, I know my loved ones will be snacking in style this year! 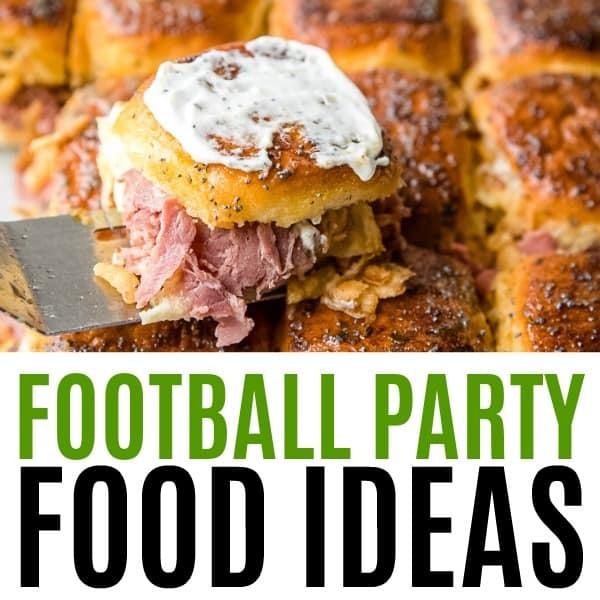 Don’t forget some of my other favorite football party food recipes! Meaty sliders with Dean's French Onion Dip, Swiss cheese, and French fried onions that'll be a touchdown at your football party! Preheat oven to 350 degrees. Spray a 9x13-baking dish with nonstick cooking spray and set aside. Using a sharp knife, without separating the rolls, slice them in half. Place the bottom portion inside the prepared baking dish and spread with Dean's French Onion Dip. Top with an even layer of cheese, roast beef, fried onions, and the remaining roll tops. In a microwave-safe dish, melt garlic butter spread and brush on the top of the rolls. Bake for 15 minutes, remove from the oven and top with additional Dean's French onion dip. Cut sliders and serve. In place of garlic butter spread, you can substitute 1/2 cup melted butter mixed together with 1/4 teaspoon garlic powder and 1/2 teaspoon dried parsley. Your football party food will be a touchdown with these easy taco cups! Filled with seasoned beef, cheese, Dean's Ranch Dip, and pico de gallo, they go fast!! Preheat oven to 400 degrees. 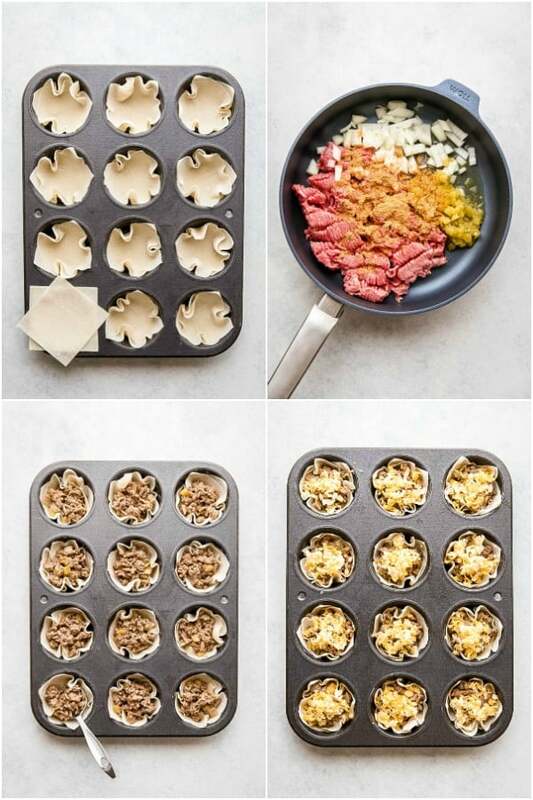 Spray a 12-cup muffin tin with nonstick cooking spray. Place two wonton wrappers, overlapped and offset, in the bottom of each cup and set aside. In a large skillet cook ground beef, onions, and green chilies over medium-high heat for 4-5 minutes until beef is no longer pink. Season with taco seasoning, and mix to combine. Place 1 1/2 tablespoons of meat mixture into each cup and top with 1 tablespoon of cheese. Bake for 10 minutes. Remove from oven and top with Dean's Ranch Dip and pico de gallo.